Wanted dead or alive, but mostly dead! This week, I met with Maddie, my newly appointed spiritual advisor. If I am sounding cavalier about this, it is unintended, in fact anything but that! I am astonished that she would actually sign up for the job, given the fact that she has a fair amount of previous unrelated experience with me. Our meetings are not complicated. Essentially I talk, she listens, asks a few timely questions, I fight back tears and emotions as I recall memories. It sounds simple, but in the midst of all of it, I know something profound is at work within me, and I have no words to express my deep gratitude towards this wise woman. As I recounted much of my story this week (abridged version) one thing became clear to me. I am not a big fan of this guy. 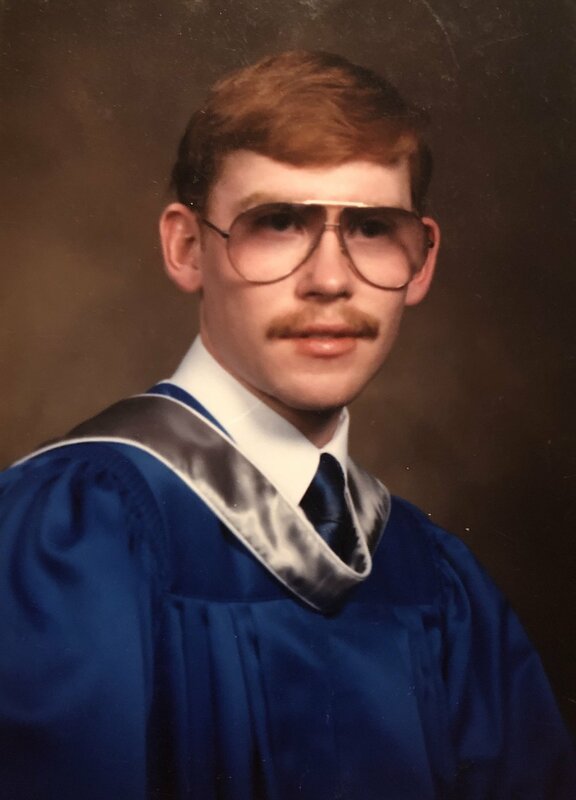 The picture is obviously a grad pic of me in 1987. What do they say, it was the best of times it was the worst of times! I won’t bore you with the gory details, but nonetheless, my last year of high school was anything but a walk in the park. Graduating with a small handful of people most of whom you have spent your entire life with up to that point. That last year was filled with much upheaval. It culminated a journey spanning twelve years, where for the most part, I was ridiculed for those ears, those goggles and that “howdy doody” hair (just think, now I’d be called a Ginger). What I am beginning to see is that a tendency of mine began that year. I established a pattern of running and hiding. I would always hide in plain site, but learned, or maybe more accurately, taught myself to adapt, to blend in, to become the person I thought the people around me wanted me to be. And perhaps most importantly, at least at this juncture in my life, I made an effort, albeit a subconscious one, to run from this tormented fellow. Shortly after the photo above was taken, I escaped to Denmark. There, I largely reinvented myself, dumping the cowboy persona, and adopting that of a pipe smoking, clog wearing, bearded hippy. I will write more on that time later, for I have much to apologize for as a result of that journey, but that is not for today. Thirty years later, I am find myself confronted with this guy. His awkwardness, his fears, his pain. I am being confronted with his many faults, his many failures, and in the midst of all of that, some amazing relationships too. Even as I write this post, I am confronted with the muted (the best I can do at this point) emotions from that time. While looking for that photo, I found many others, with many people who I rarely think of anymore. Needless to say, it wasn’t a cherry box to rummage through tonight. But it is my box, and it is my history. It is I am sure, like many, a very flawed history. There is laughter to be sure, but there is much loneliness, much confusion, much pain. I think it is probably why I embarked on my “adventure” abroad, and never looked back. I was running from all of that, and also running from the guy pictured above. Maddie tells me that I need to figure out how to love that guy. I haven’t figured that out yet. Actually I am still (this week in fact) talking about killing that guy off for good. Maybe this isn’t all that odd, I actually don’t know how much of this is a common experience. What I do know is that a pattern began back then, where I developed my chameleon superpower, fuelled by shame, and insecurity. And now, thirty years later, I am realizing that far from discovering a superpower, I built for myself a super prison, walling in my emotions, and effectively (inadvertently) keeping out any beneficial emotions in the process. So now I have begun to dismantle the immense dam I have spent a lifetime building, brick by brick, slowly, out of fear that dismantling it too fast will result in a full breach; the resulting spill creating chaos and destruction on the dry land downstream. With all of that said, standing on the wall above that dry valley, I think I can make out an old riverbed, longing to have water flowing through it once again. And maybe, just maybe, I can make out the guy above standing down there, smiling, waving, welcoming me home?